The Sony X9350D is easily one of the best TVs to buy in India today. It delivers good contrast and black levels, and the speakers provide better audio output than any of its competitors. It's a good choice for those who like true to life picture, instead of artificial and oversaturated images. Also, if you're buying a TV in this range, the X9350D provides a more complete package than most others. A very real problem with high-end TVs today is that they can’t produce good sound. As TVs get thinner, the space required to fit a good speaker system is unavailable. The Sony X9350D 4K HDR TV aims to solve this particular issue. The X9350D is an acquired taste. 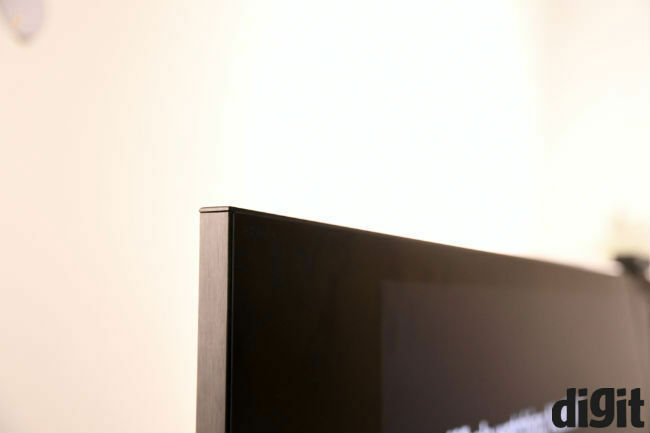 It’s not your regular slim and sleek television. 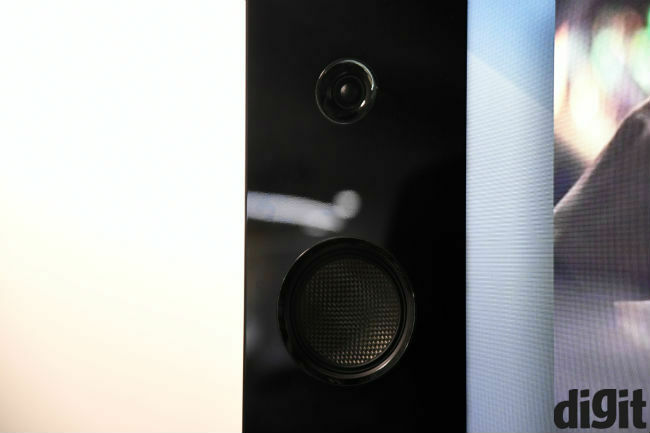 While Sony’s intent is to retain the slim looks, the speakers don’t exactly allow the same. The “wedge design” as Sony calls it, is thin near the top, while gradually increasing in thickness as you move downwards. As a result, the overall form factor still has a somewhat slim appeal to it, although it’s not as slim as Samsung’s top-end SUHD TVs, and is far removed from LG’s ultra-slim OLEDs. From the front, the TV looks different, and it’s more of an acquired taste. Personally, we liked the looks, but it did take a little getting used to. It’s not the sleek like competing TVs from Samsung and LG, but it can definitely go toe to toe with them. One thing you do get with this TV, though, is an imposing presence in your living room. 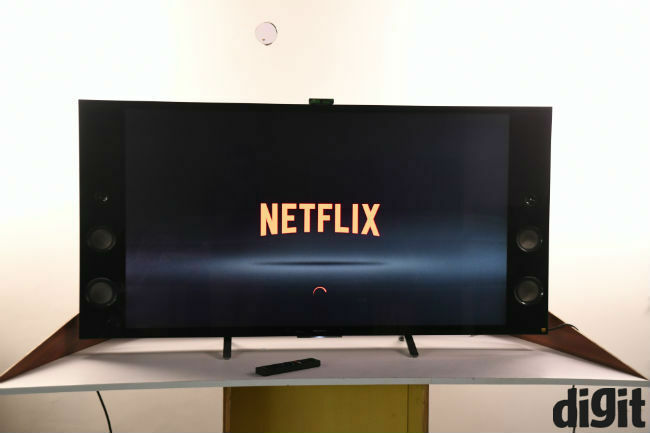 It seeks attention, and a 55-inch screen combined with the speakers means it’ll take up considerable space on your wall. Whether you like this is a personal choice, of course. The ports lie on the back, facing sideways, and the Android TV camera, which comes in the box with this one, can be fitted on top of the TV, connected via a USB on the side. Overall, it takes a while to get used to the looks of this television, but many would still find this to be a good looking TV. Apart from the usual HDMI and USB inputs, Sony’s flagship TV also allows you to plug in your phone using the MHL standard. One of the HDMI ports on the back supports this standard. Using this, you can mirror your tablet or phone to the TV, and control them using the remote. Sony also has an MHL cable available, as an optional accessory with the TV. It is also worth noting that all the HDMI ports on the X9350D are HDCP 2.2 compliant, which means your devices need to have the same license. HDCP is basically the HDMI equivalent of Digital Rights Management (DRM), and provides content protection over HDMI. Microsoft’s Xbox One, Sony’s Playstation 4 and Google’s Chromecast are some HDCP compliant devices, but if you plan to attach other devices, it would be worth checking whether they’re HDCP compliant. Physical connections aside, the Sony X9350D of course supports Wi-Fi and Ethernet connections for the Internet, and being an AndroidTV device, it is also Google Cast enabled. This means many of your Android phones etc. will be able to cast to the TV without a Chromecast attached. Further, the remote on the X9350D is somewhat of a downer. It’s the same remote that you get with the X9300D that we reviewed earlier. As with that TV, the buttons are easy enough to click, but they’re buttons. 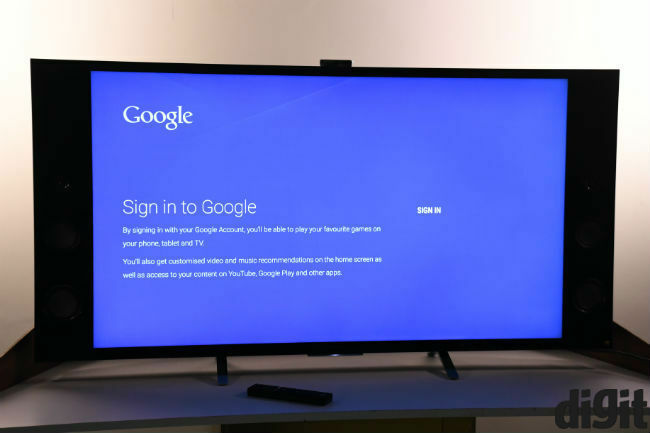 The TV begs for a trackpad like the original AndroidTV remote, and entering passwords etc. using the remote is frustrating. 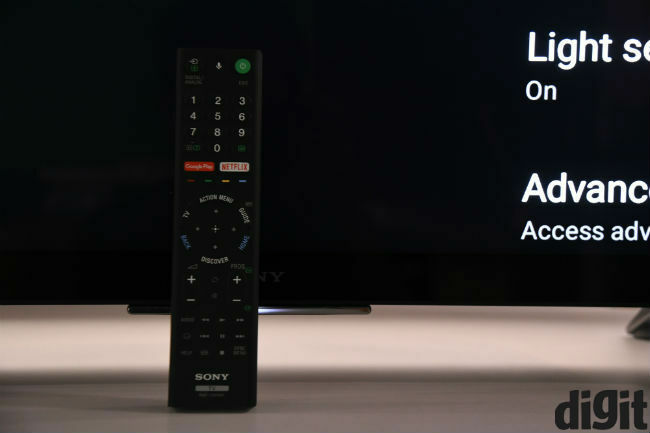 Sony’s integration of the AndroidTV remote into its own has allowed voice to be accessed from this remote, though, and as with phones, Google is better with voice search than Samsung’s Tizen or LG’s WebOS. Having reviewed the Sony X9300D before this, the picture quality came as no surprise. This one uses the same Triluminous technology, along with the 4K X-Reality Pro engine by Sony. While the Triluminous tech takes care of colours, the X-Reality engine is responsible for noise reduction and sharpness, and they both work pretty well together. That said, the Sony X9350D lacks sightly in sharpness, compared to a Samsung SUHD 55KS9000. In terms of colour reproduction, the X9350D produces more true to life colours than the SUHD’s oversaturated images. The major difference, though, is in terms of upscaling, where the Sony engine does much better than the Samsung SUHD. The SUHD tends to soften images on the screen when upscaling content and there’s quite a bit of noise, while the Sony X9350D deals with noise better, and keeps sharpness to more acceptable levels. This is important for those buying a 4K TV for future benefits, while using it to view high quality 1080p content today. The picture quality is quite great on the Sony TV, but it’s more suited to those who like true to life colours. If you enjoy the artificial oversaturation of AMOLED screens on phones, the Samsung SUHD would better suit your viewing needs. From a picture quality point of view, the Sony X9350D is equivalent to the X9300D that we reviewed earlier, which makes it one of the best you can get today. What takes it a step ahead is the audio that we shall discuss next. The X9350D employs Sony’s Clear Phase Speaker technology, which had originally been built for flat panels. The TV has four 12.5 Watt speakers and two 20 Watt speakers, which are perhaps the bass drivers. The goal here is to deliver not only loud audio output, but to manage the quality of audio as well. Largely, the Sony TV does succeed at that, although, we expected more detail in audio. The mids are practically absent, so you won’t get audio details when trying to listen to music. However, given that the speakers are meant for TV viewing, this does make sense. The highs are elevated, in order to suit voice delivery in dialogues, but the bass is still quite low. Comparing side by side to other TVs, you’ll definitely get better audio from the Sony X9350D, but one wonders whether Sony could have done better. Action sequences, like the scene where The Hulk is thrashing Loki, sound better on the Sony X9350D TV. Shattering glass sounds more realistic, as does the floor crumbling beneath Loki’s body. Sticking with the Avengers movie, a marked difference is in how the exploding arrow from Hawkeye sounds on the Sony X9350D, compared to its competitors. The explosion sounds more impactful on the Sony TV, where others tend to make it tinny. Overall, while the Sony TV does have the best audio quality amongst HDR TVs available in India today, we did expect even more. Our biggest issue with the Sony X9350D was with the OS it runs on. Google’s Android TV is still in the developing stage, and it’s incredibly slow to be really useful. The X9350D will give you ‘loading’ messages almost every time you press a button on the remote. Since Sony is the only one using the Android TV interface, we don’t have a reference point to determine whether it’s the hardware in the TV that makes the OS slow, or whether it’s the OS itself. However, the end result remains, that the X9350 is slow. 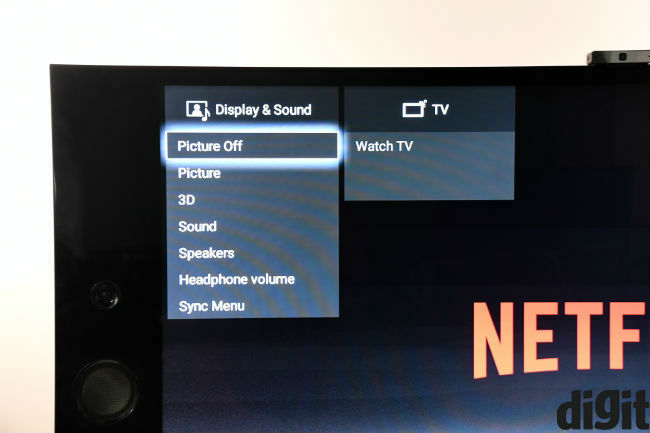 From the general menus to switching between apps, to launching Netflix using the dedicated button, the TV is generally slower than what you get. Having said that, Android TV still has an advantage (a slender one at that) over Tizen and WebOS in the number of apps you can get. The app support is not vastly better, but we could find a few more apps on Android TV than we did on the Tizen and WebOS stores. The Sony X9300D was priced at Rs. 2,64,900 and it was delivered pretty much the same quality as the X9350D. However, if you’re buying a TV in this price range, it does make sense to pay an extra Rs. 20,000 for the Sony X9350D. It is priced at Rs. 2,84,900, and is a better performer than the Samsung SUHD 55KS9000. However, if you can afford LG’s OLED TVs, they remain our TVs of choice in this price range. Is the 65\' vu HDR UHD TV worth buying? Is it better then leeco super TV series?